This was a really fun one, and totally followed one of my tenents of small mosaics: letting the materials suggest a design. I started out by arranging the black tourmaline pieces at the bottom, and it completely reminded me of those poles that you see on docks sometimes that always seem to have birds on them. So of course, then I had to have a bird, and doing such a tiny bird was challenging, but satisfying. 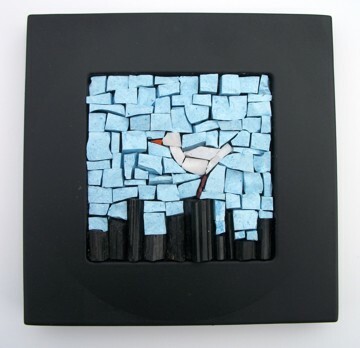 A bird in less than 10 tesserae... you are either an evil genius, or a muse. I vote for evil genius.